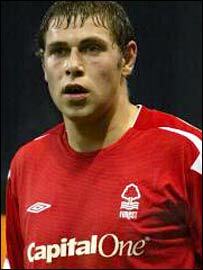 12 | January | 2008 | Through the seasons before us..
Rampant Forest hit Orient for four! It was a game of two halves, and two halves of four quarters. Orient showing why they’ve been contenders at the top of the table in the first quarter of each half, but Forest responding in the remaining three-quarters of each half to show that, despite being thin on the ground in the striking department, we should still not be written off. That said, I do feel that Orient will feel hard done to with the resounding scoreline. The win puts us back up to second in the league, and also gave us very reassuring signs from Grant Holt – who I’ve been giving a hard time lately – well, credit where it’s due, he made a valiant contribution today; and was visibly much improved upon getting on the scoresheet with a thumping header in the first half – perhaps it was a confidence thing from him with a lack of goals this season, who knows, but I’d like to see more of it please, Grant! But it wasn’t all swashbuckling attacking – it was Orient who drew first blood on the chance from, the dangerous Sean Thornton forced Smith into a save from a freekick in the first half, a decent save from close range when Barcham looked through. We rode our luck slightly too, Thornton again the danger when he unleashed a powerful shot from around 30 yards, crashing the ball against the post and out – fortunately the Orient striker following in wasn’t able to connect, and eventually Forest conceded a corner. It was around the half hour mark that Forest registered a first chance on goal, Holt did well to get a head on Commons’ cross, but it was weak and perhaps the better option would’ve been to swing a speculative left-footed shot at it. However, it wasn’t long before the goal arrived, a short corner by Davies was whipped in perfectly by Commons for Grant to plant a header into the net from close range. The final act of the first half was some delightful skill from Davies; McGugan chipped the ball forward for the winger to chest down and volley, but he didn’t get much power on it, and Nelson in the Orient goal did well to save it. The second half started with Orient again piling forward. Gray looked certain to score when played through brilliantly by Thornton – leaving the Forest defence rather flat footed – but Smith was off his line quickly and gave him very little to aim at, blocking the eventual shot with his legs. It took some solid defending from Lockwood – who got an excellent reception from the good number of travelling Orient fans – and Breckin to block another chance before Smith could gather the ball. Forest started to get back into the game though, and claimed a penalty (there was a decent shout for a penalty in the first half for us, I thought, too) when Holt latched onto a throughball from Davies, he rounded Nelson but was brought down – oddly despite giving the penalty, the referee only opted to book the goalkeeper. Given the horrendous decision we saw on New Years Day that rankled a bit at the time, but given how the game played out, I’m not too concerned. Grant stepped up to take the penalty himself, planting it firmly to the left – the ‘keeper looked to have gotten a hand to it, but it was well struck and gave Grant, and us, our second goal of the game. Orient responded to this with a couple of substitutions, taking off the ineffective Gray for Echanomi, and former-Stag Wayne Corden for Demetriou, but the game remained firmly in Forest’s favour until the final whistle came. Commons was next on the scoresheet, he’d just been blatantly fouled and the very l’aissez faire referee had waved play on. Kris responded to this by making a great run to pick up on a ball played forward by Breckin, and after a couple of stepovers gave him room just inside the box he coolly struck the ball into the net off the post – with the Orient keeper completely rooted to the line to put the game beyond doubt. At this point Smoulders took the opportunity to put Sinclair on for Davies, putting the youngster upfront and Grant back into midfield (don’t get me started!…). Smith was still performing heroics when required, making an excellent close-range save from Barcham, and a more routine one from another long-range Thornton effort. Another youngster, Matt Thornhill, was introduced for Cohen with ten minutes left, and Chambers came on for Perch who’d picked up a knock. Sinclair almost got a quick goal after Commons fired in a vicious cross with the youngster and Grant Holt just unable to get on the end of the ball. Sinclair was to have an impact though, with just a couple of minutes to play Emile found himself with the ball at his feet in the box, with defenders blocking his route to goal he had the presence of mind to square the ball to Thornhill, who miscued slightly but still manged to bundle the ball into the net to give us four goals. An excellent win, and very heartening given our obvious lack of striker options – I hope that this isn’t used as an excuse not to strengthen in the window; but having heard Smoulds’ post-match interview it would suggest not. He suggested that the chase for Leon Best is not over yet, and another bid would be going in. There are plenty of suggestions around the ground that the Nottingham-born striker is keen on a move, so it remains to be seen whether we can make it happen. But for today at least we can be delighted with an excellent win with a resounding scoreline against a promotion rival. Every player had a decent game, and as a team at times we knocked the ball around very well and with confidence. Certainly there are areas for improvement, but when is that ever not going to be the case? A solid win that certainly exceeded my expectations upon leaving the house. Well done Forest! Taylor to sign next week? “We like him, we want to bring him back to the club, he is scheduled to join up with us again on Sunday, because Vauxhall play Burton in the FA Trophy today. “He gave a good performance for the reserves, he looked as though he could calmly score goals – as he did in the first minute. “He is a goal scorer and plenty of clubs have taken people from obscurity before and suddenly they look good. He has aggression, he has a bit of pace about him. He is not quite as good as some people think, but he is certainly a prospect.